You can place an empty cell between other cells. NOTEInserting a blank cell never overwrites existing cells, even if the Xsheet view is set to Overwrite mode. This is because overwriting existing cells with blank cells would replicate the behavior of deleting exposure. In the Timeline or Xsheet view, select the cell in which you want to insert a blank cell. 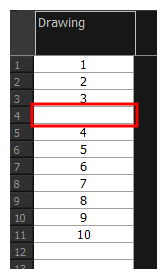 In the top menu, select Animation > Cell > Insert Blank Cell. 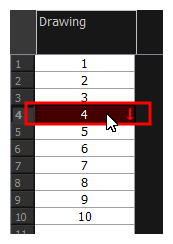 Right-click and select Exposure > Insert Blank Cell. In the Timeline or Xsheet toolbar, click the Insert Blank Cell button. Note that you may have to add this button to your toolbar by right-clicking on it and selecting Customize. A blank cell is inserted.